THE ALTAI MOUNTAINS ARE 2000 KILOMETERS LONG RANGES THAT ASSEMBLE INCREDIBLY CONTRASTING TYPES OF TERRAINS, AMBIENTS, NATURAL SIGHTS AND BEAUTIES HIDING SIBERIA’S HIGHEST, MOST BEAUTIFUL AND MOST MYSTERIOUS PEAK. The Altai Mountains are a mountain range in Central and East Asia, where Russia, Mongolia, Kazakhstan and China join forces together with the headwaters of the Irtysh and Ob rivers. From the northeast to the east, the Altai Mountains combine with the Sayan Mountains, while on the southeast the range becomes lower and joins the high plateau of the Gobi Desert. All the languages of this vast territory, Mongolian, Chinese and Turkic, have the same meaning for their own version of the word ‘’altai’’, meaning “gold”. These Golden Mountains host some real hidden treasures, which will stay unknown till the end of time. Thanks to their mystifying beauty, they are also named Russian Tibet, Siberian Switzerland, North-Tchuya Alps, the Katun Alps . Mount Belukha, or Belucha, is part of the snow coated Russian mountain ranges known as the Kayun Mountains. This twin-peaked mountain massif rises along the border of Russia and Kazakhstan. Altaians call it Kadyn Bazhy, but is also named Uch-Sumer. In the Russian part of the Altai Mountains, Belukha is the highest peak. The eastern peak is higher than the western one, 4506m (14784 ft) in comparison to 4440m (14567 ft). The glaciers cover around 70 square kilometers, with the largest named Berel, at a height of 1950 meters (6397 ft). The most famous glacier is eponymous with the peaks. The region in which Mount Belucha lies receives snowfall all year round. The largest river in this region, the Katyn river, runs down the Belukha slopes. 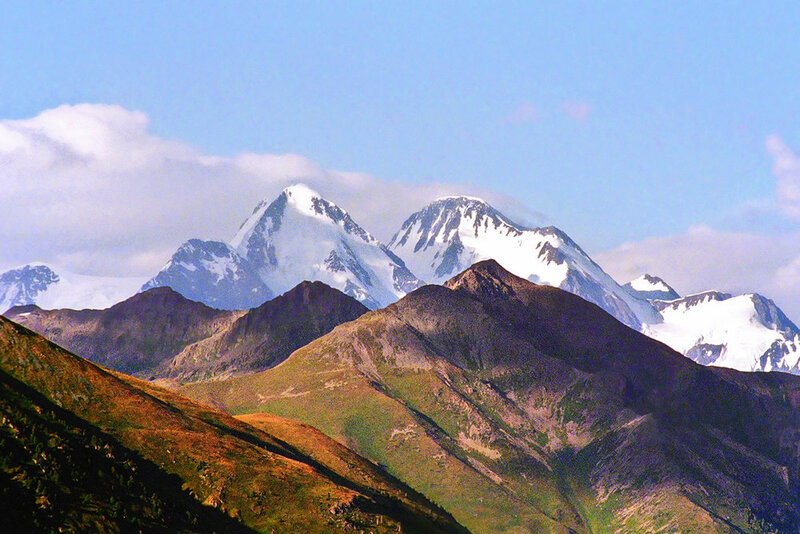 Compared to its neighbours, like the Pamirs or the Caucasus, Belukha does not stand out for its height. Mountain Belukha is a particular natural object, full of contrasts of diverse natural complexes, still little known, attracting attention of scientists, ministers and followers of different cults, nature lovers, mountain climbers and tourists. Mountain Belukha is raising high above the neighboring watershed ranges and ties the Katun range system of spurs into one knot. Rocks, screes and moraines occupy big parts of the mountain massif. Around 60 per cent of the glaciers on Katun can be seen on the valleys and slopes of Mout Belukha. The most visible aspect of the glaciers are the feeding reservoirs that are located at high altitudes, elevated glacier fields, and low position of glacier end points. There are two types of meadows covered with alpine low-grass and sub alpine high-grass meeting below a glacier line, moraines and stony spurs mixed with mosses and lichens and some rare multicoloured flowers. Surprisingly, at the same time you can find some bushy tundras where dwarf brush trees and willows grow. They are replaced by the belt of upper sparse woods in the form of larch and Siberian pine. The upper forest line is at the elevation 2,000 - 2,200m above the sea level, depending on the slope exposition. The plant world is characterized by a great variety of species and variability of associations. Some of them are edible, medicinal or rare. Blue rivers feeding the meadows, forming one of the greenest mountains of the region; bustling horses aiding the tribes, shaping the history of many distant places by their fearsome horsemen. Altaic people, back then and now, well accepted the fact that these mountains have something holy in them. Only the choosen ones could get closer to them and climb them, while the simple mortals were predestined to worship them in silence. This was one of the reasons why they called these mountains dispreading through the sky the Mountain of Gold, or Golden Mountain - Alt-tai. The first people who arrived to the region had been dominated by the harsh nature. They needed special human beings, brave ones, who can ascend up into the lands of Gods and talk to them, bargain with them, and seek their help in times of need. Shamans, beating their drums, forecast the future, healed the sickness, chased the evil spirits away and encouraged the warriors. The tribal organization of the society helped them to empower their free lifestyle. And, of course, encouraged the warriors to plunder the neighboring territories. The disorder they caused forced the neighbors to take action against this frightening people who could mount their horses on day and night. Even though annexed by the Qing Dynasty of China, and then by the Mongols, the Altaic people had been less likely to be ruled over by foreign people for they hold freedom dear, something they had learned from their rivers, horses, and mountains, until the Russians came with their superior guns and mighty Tsars. The demographic structure on and around the mountain was changed by the Russian Empire, and later by the Soviet Union. Forced migrations and heavy industrialization took place, yet, the mountains remained intact along with the culture of the people who have been living there. The ancient people who lived in the Altai Mountains are called Pazyryk and are in the direct connection with special archeological findings that include mummies found frozen in the permafrost. The ancient custom incredibly resembles the tomb mounds of the legendary Scythian people. The Siberian Ice Maiden, also known as the Siberian Ice Princess, and other archaeological finds, were located at sites on the Ukok Plateau.The current location of the artifacts is in Novosibirsk. Today, the Altaic people, having been influenced by Buddhism, Orthodox Christianity, and Shamanism, live mostly in Altai Krai and Altai Republic in Russia peacefully with the Russians and the Kazakhs side by side. However, within the last century, due to excessive migration of the ethnic Russians, the percentage of the Altay, the Altaic people of the region, was slightly reduced, but the traditional lifestyle has been preserved by the indigenous people of this harsh territory. GEOGRAPHY OF THE ALTAI MOUNTAINS. THE NORTH AND THE SOUTH. North of the Altai Moutains and west of Lake Baikal lies South Central Siberia, also known as Southern Siberia. As part of the region, we can name different federal subjects of Russia like Altai Republic, Altai Krai, Kemerovo Oblast, Tuva Republic, Tomsk Oblast.. Kmereovo Oblast is penetrated with a belt of mountains, followed by the plains on the both sides. The mythical Trans-Siberian Railway stops in the cities of Novokuznetsk creating a parallel line to the one that goes from Novosibrsk to Krasnoyarsk. In the north of the region is the Kolyvan Altai, extending to the Sayan Mountains. Their elevation is between 1500 to 1750m (around 5000ft). Some of the mountain passes are : Ulan-daban (2,827m) and Chapchan-daban (3,217m), both quite demanding . On the east and southeast the terrain progressively changes into minor plateaus and valleys like Ukok with Pazyryk Valley, Chuya, Kendykty, Kak, all of them set at the altitude of around 2500m (8202 ft). The region is dotted with big, salt lakes like Uvs, whose tiny part lies in Russia and the rest in Mongolia, making it the largest lake in Mongolia. Khyragas, Dorgon and Khar also salty lakes, parts of western Mongolia’s Great Lake Depression. The territory is crisscrossed with diverse mountain ranges, the main one being Tannu-Ola Mountains, stretching alongside with the the Sayan Mountains to the Kosso-gol in the east. The Khan Khökhii mountains also extend in this region, in the west and east parts. Khuiten Peak 4374m (14350 ft) is the second highest peak of the range, falling within the borders of Mongolia. The Chuya Alps have an average elevation of 2700m (8858 ft) and its summits are located at 3500m (11482 ft) and 3700m (12139 ft). There are also, The Katun Alps, with average elevation of about 3000m (9842 ft), the Kholzun range, the Korgon, Talitskand Selitsk ranges and the Tigeretsk Alps. All are spotted with wide lakes, numerous spurs and snowy peaks which forms a harmonius paysage full of unexpected details. Matching in their diversity the landscapes immerse into one another. The slopes of Belukha host The Katun Valley which begins as a wild gorge. After the Katun river penetrates the Katun Alps and enters a wider valley, at the elevation of 600 to 1100m, the river follows it untill it appears in the Altai Highlands to join the Biya River which flows out of Teletskoye Lake. Those two rivers together form the Ob, the seventh longest river in the world and the westernmost one that flows into the Arctic Ocean. The Biya River is 301 km long. The Teletskoye Lake is the largest lake in the Altai Mountains and in the Altai Republic and has a depth of 325m and a surface of 233km. It lies on the junction of the Sailughem Mountains and the Western Sayans and between mountain ridges Korbu and Al-tyntu. The lake contains no less than 40 km (9.6 cubic miles) of fresh water. The lake is included into the Altaisky Nature Reserve which was listed as one of UNESCO World Natural Heritage Sites under the name ‘’Golden Mountains of Altai.’’The Altai people have a legend about the name of the lake which in their language means Golden Lake. Once upon a time, there was a rich man who had an ingot of gold, which he wanted to use to buy food. He was travelling around the region in order to buy some food but he couldn’t find any. He decided to throw the gold into the lake. The Altai Nature Reserve is recognized as an area of high biodiversity and isolation from human intrusion. It is also part of UNESCO World Network of Biosphere Reserves. In other words, this region is accepted as a biosphere reserve which means that it shows a balanced relationship between people and nature and encourages sustainable development. The Chulyshman River runs into the lake, with the Chulyshman valley forming part of the western border of the Altai Reserve. Plains and alpine ridges of the Chulyshman Highlands form the most of the reserve. Over 20% of the territory is rock, scree and gravel. On the high plateaus there are over a 1,000 alpine lakes greater than 1 hectare in size. Katun Nature Reserve is based in the highlands of the Altai Mountains of South Siberia. The headwaters of the Katun River arise on Mouth Belukha, on the far eastern edge of the preserve. It is internationally recognized center of biodiversity, a part of the Golden Mountains of Altai, UNESCO World Heritage Site. The Reserve is located in the Usk-Koksinsky District, which occupies the area of 12,960 square kilometers (5,000 sq mi). The topography of the reserve includes glaciers, alpine tundra, meadows and forests. Much of the terrain has been formed through glaciation, creating small lakes, streams, waterfalls, and steep slopes. Ukok Plateau Nature Refuge is a distant and pure grassland, occupying the Russian part of the Altai Mountains region. It is part of the UNESCO World Heritage Site providing a habitat for many endangered species including one of its least studied predatory animals, the snow leopard. The Ukok Plateau is currently exposed to a danger of plans for building a gas pipeline between China and Russia. The danger is also coming from an idea to build a road through it, as well as the depletion of the steppe by ranchers. The word uheg literally means box, elongated cabinet, massive mountain, big hill with a flat top. According to the oral testimony, the word ukok in Kyrgyz refers to flat-topped mountains, plateaus. The plateau is at 2,200–2,500 m (7,200–8,200 ft) with mountain peaks that rise up to 600 metre high above the plateaus. The Charysh River, a 547-kilometre (340 mi) long river in south-western Siberia in Russia, flowing from the Korgon mountains in the Republic of Altai, descends into the pre-altaic depression in the Altai Krai, and flows into the Ob 100 kilometres (62 mi) upstream of the regional capital of Barnaul. The Altai seen from the valley of Charysh River offers idyllic scenes complete with small but deep Kolyvan Lake, surrounded by fantastic granite domes and towers. The valleys of Uba, Ulba and Bukhtarma rivers in Kazakhstan open towards the Irtysh river. The lower valley of Uba is densely populated. The Bukhtarma valley follows the Bukhtarma river for about 320 kilometres, and rises at the foot of the Belukha and the Kuitun peaks, falling for 1500m in 300km, from an alpine plateau at an elevation of 1900m to the Bukhtarma fortress (345m), offering the most extraordinary variety of landscapes and vegetation. The upper parts are dominated by the glaciers, the best known one being the Berel, coming down from Byelukha. The upper courses of Bukhtarma and the Katun rivers are separated by the Katun glacier that changes from two ice-falls to 700-900m wide river course, from attractive grotto to a stormy river. The lower and middle parts of Bukhtarma river valleys were inhabited by Russian pesants, serfs, religious schismatics, who created a free republic on this Chinese territory, which after Russian annexation became rapidily colonized. Little known is known about the higher part, even today, and they are regularly visited only by the Kyrgyz shepards. The valleys of Bashkaus, Chulyshman and Chulcha rivers, all of them flowing into the lake of Teltskoye, are populated by Telengit people. The shores of the lake rise almost to 1800m. The Biya river, as a tributary of Katun river, joins with it at Biysk city, and then meanders through the prairies of the north-west of the Altai. Up north, The Altaii highlands continue into the Kuznetsk district. On the western shoulder of the Sayan mountains is the Abakan River, located in the Republic of Khakassia, a part of the system of the Yenisei, the largest river system flowing to the Arctic Ocean. The Kuznetsk Ala-tau range, on the left bank of Abakan, the capital of Kahkassia, runs to the government of Yeniseisk, the town in Krasnoyarsk Krai, while on the other hand a complex of Chukchut, Salair and Abakan mountains spreads towards the Trans-Siberian Railway in the north, and towards the Ob river in the west. The Ek-tagh, or Mongolian Altai, which separates the Khovd basin on the north from the Irtysh basin on the south, is a steep and lofty escarpment from the Dzungarian depression, but descends on the north by a relatively short slope to the plateau of north-western Mongolia. The range is continued by a double series of mountain chains, all of which exhibit less sharp geographical features and have lower elevations. The slopes are inhabited by nomadic Kyrgyz. The freedom-loving people of the Altai Mountains live not only side by side with the newcomers to the region, but are also used to sharing their territory with wild animals as well. Some of those animals are endemic to the Altai Mountains, giving the character to the region and forming a highly dynamic ecosystem in this rough terrain. This is the largest sheep in the world. An average male Argali can weigh up to 180 kilograms, and the heaviest male Argali recorded weighed over 210 kilograms. This species prefers to live in the high peaks of the Altai Mountains, far away from humans, but due to the highly valuable horns of these sheep, they are endangered in most regions. This sacred bird of prey has always been an eminent part of the people who lived in this region. The Altai people have sought the help of Golden Eagles when they went hunting. It is known as the fastest animal in the world with the speed of 300 kilometers per hour, the speed they reach when they target their prey. Without the existence of the Argali Sheep in the Altai Mountains, the Snow Leopard would not have survived the cold winters nor the breezy springs. This elegant animal with highly developed hunting skills and charming fur would prey on any animal they would come into contact with. Unfortunately, due to their preferences on their living spaces, high elevations and uneven terrains, it can be quite a challenge to see one of them in the wildlife. An animal with long, curved horns and beard of the old wise men of Asia. Both sexes of the Siberian Ibex have these fascinating horns and beard which make them highly recognizable. They prefer to live well above the tree line, in rocky valleys, and even in deserts. Even though they are known for their climbing skills and agility, the young members of a Siberian Ibex family can be preyed by small animals such as foxes or eagles. Foxes are known for their cunning characters in the region. In order to understand why the locals attributed such a trait to these small but agile animals one needs to see a Corsac Fox, sitting over a rock, gazing the territory as if it is conspiring its master plan against its preys. These animals can weigh around 2 to 3 kilograms, and can change their thickness and the color of their fur in accord with seasonal changes. Cats are adored in many cultures for their playful characters, yet the Eurasian Lynx, whose homeland can stretch from Northern Europe to the eastern most tips of Asia, is not one of those lovely domestic friends of ours. They even compete with the wolves, which can prey on large animals, and their eyes become sharper as the sun continues its journey further into the West. What makes the Altai Mountains interesting in terms of the flora is the fact that this mountain range includes four highly distinct vegetation zones: the mountain sub-desert, the mountain steppe, the mountain forest, and the alpine regions. These layers of zones accommodate different types of floras, thus, different types of faunas. The first layer, which is basically an arid land, has hot summers and very low precipitation. The plants that can survive such harsh conditions, such as drought-tolerant and salt-tolerant plants, can be seen in this zone. This is the layer that gives most of the characteristics to the Altai Mountains - the vast green meadows. This zone rises up to 600 meters in the north and 2000m in the south, and accommodates steppe shrubs, herbs, and different types of grasses. The forests are the main vegetation of the Altai Mountains. It covers more than half of the whole region, and rises up to around 2500 meters. Pines, firs, and larches can be seen along with aspen forests and birch with lesser frequency. The breezy springs and cool summers in the forests of the Altaic Mountain make a big contrast with the lower parts of this mountain range. The meadows for summer pasture for the local people and the fauna, icy bare rocks, covered by mosses here and there. The visitors can also see different types of sub-Alpine shrubs, accommodating buzzy bugs enjoying the short period of relatively warmer seasons. This layer can be seen only on the highest peaks and the ridges. Since the beginning of time, the tribes settled in Altai treated Belukha with respect and admiration. First written mention of Belukha is from 1793, while the first traveler who saw Belukha was European traveler Gebler. The first scientist who used to research Belukha thoroughly since 1835. was Russian professor V.V.Sapognikov. He tried to climb Belukha for the first time. Nevertheless it was the Tronov brothers who first climbed Belukha in 1914. Most ascents of the eastern peak follow the same southern route as that taken in the first ascent. The summit climb is characterized by different terrains, and accordingly hikers and climbers should be in a perfect physical condition and are expected to have basic climbing skills and full mountaineering equipment. Hikers and climbers can carry their own luggage or request horses at the base camp, or discuss this option with their travel agency or guide. The weather conditions can be harsh. Waterproof clothing, sleeping bags, light boots and warm jackets are just a few items that are needed to hike the terrain. East Summit of Belukha is far more accessible and climbed more often than the West one. The most used route to the this top of Belukha is from Russia, being graded as PD+ .Since it’s quite a remote place, arriving to the location will require some time. Once in Barnaul, a city reachable by a five hour long flight from Moscow, it is possible to take a minibus or taxi for the next 800km, somewhat of 400 km the road will be bad mud one, leading to Tungur (Belukha Natural Park, Altai Republic), the settlement located on the bank of impressive Katun river. Tungur, which means tambourine or shamanic drum, is the outset for popular hiking, equestrian or water routes. After the long ride, you will probably need to rest for a night. You can check the accommodation info here. Usually people take a two-day horseback ride to Akkem lake where the trail to the base of Belukha starts. Usually the road from Akkem lake to the Tomsk bivouac, at the foot of Belukha, lasts for one day. Don’t forget that you need some documents for crossing the Russian border from Kazakhstan, although that rule does not apply in the other direction. There are many others peaks that can be climbed such as Khüiten Peak on the border between China and Mongolia. Although the region is quite popular, the tourist infrastructure is very poor. From Tungur, hiking tours can be organized to Kucherlinskoe Lakes, Akkem Lake, passing Kuzuyak and up the Akkem river. Akkem lake is located in Akkem river valley, on the northern slope of Mount Belukha. "AK" means “white”, “dull white”. The nearest village to Belukha is Tungur, located 45km from the lake. It is located on a 2000 meters high plateau, extending from north to south for 1350 meters and is wide approx. 600 m. Beaches unexpectedly go down and reach a maximum depth of about 15 meters. Average depth of the lake is -7.8 meters. The basin of lake is a typical glacier shaped through mountain valley. Lakesides are composed of loose glacial deposits and covered with tundra moss shrub. Akkem lake water color is murky, gray-white, and dark blue in evening. The lake has a break made from the solid material, which is carried by the Akkem river from glacier, so there are no fish. The bottom of the lake is glacial silt. In calm weather, without ripples, surface mirrors two-kilometer ice wall (Akkem Wall) of the snow-white mountains which is truly majestic. Kucherlinskoye (Kadzhur-ly or Kudyurlu – “With soils”) Lake/ Lake Kucherla is located in the upper reaches of Kucherla River at the foot of the northern slope of Katun ridge. The nearest town is Kucherla Village and Tungur village. Equestrian trail with a length of 34 km runs from Kucherla village. Kucherlinskoe Lake extends in the direction south-north for 5220 meters. The average width is 575 meters. The basin of the lake was formed by ancient glacier moving. The maximum depth of Kucherlinskloe Lake is 54.8 meters. At the source of Kucherla River, lake is shallow. On the coastal strip, there are a lot of honeysuckle plants and cranberries. Kucherlinskoe Lake is one of the largest water basins of glacial origin. The lake is located at an altitude of 1790 meters. On the right slope of the lake, at an altitude of 2300 meters, one of the most beautiful lakes is located. Blue Lake feeds Kucherlinskoe together with glaciers. Average January temperature on the shores of the Lake is -18 C, while July temperature is around +11, but night frosts are possible even in July. The annual rainfall is 550 mm. Outskirts of the Lake are mostly subalpine and alpine meadows, often visited by the Siberian mountain goats and snow leopards.The turquoise color of the water, high cliffs, forested slopes, mixed with the noise of falling water makes the beauty of this place surreal. In the morning and in the evening, when the sunrays fall down from certain angles, surface of the Lake mirrors image of the blue sky, mountain slopes covered with larch and cedars. Kucherla Lake is located 100 meters above the Kucherlinskoe Lake at an altitude of 1795 meters. It has 480 meters in length and 200 meters in width. It looks like an expanded bed of Kucherla River. Kucherlinskoe Lake is part of the territory of the Natural Park "Belukha". For some additional information, check http://travel-altai.com/regions/belukha/kucherla-river.html . As one has already understood, hiking and trekking in this vast territory can be as demanding as one would like it to be. The scenery fulfills the dreams. The most popular parts of the Altai are in the east. The Katon Kargai Valley with many side valleys offers gradual change from the valley to the steeper terrain that leads to the ascent of Mount Belukha. The Rachmanov springs are near, with the lake Markakol being the biggest attraction. For further information check https://caravanistan.com/kazakhstan/altai/katon-karagai/. Hiking to the foot of Belukha is also an option, using a ghost town of Kokkol as a base. Kokkol was built in 1930 under a thundering cascade to mine for quartz, molybden, wolframite. A hike to Rachmanov springs takes around 2 days.